Yes, it's here again. And this is a short bulletin just to bring you up to date on all that is happening today. We have, of course, the FlashFlood which starts at midnight and runs all the way through the day. A story will be published every 10 minutes on the blog, with a few extras across the middle of the day, bringing you a total of 148 wonderful, new flashes for you to enjoy. Over the 7 years of NFFD this journal has had nearly 420,000 views, and we would love to be able to get even closer to the magical half million mark, so please do share the stories across your media and bring the joy to the world. We also have a number of events going on around the country, including the launch of the novella-in-flash Three Sisters of Stone by Stephanie Hutton in Hanley, Stoke. This is preceded by a workshop and more information is here. Our friends over at TSS Publishing (theshortstory.co.uk) are today launching a project to catalogue and celebrate the best in British and Irish Flash-Fiction over the next year. More information about this is on their Facebook Page. And if you are in the Bristol area, there is so much to enjoy: a Flash-walk, two workshops, a panel on competitions,and the launch of the new anthology. All the details for that are on the Bristol Flash Facebook page. 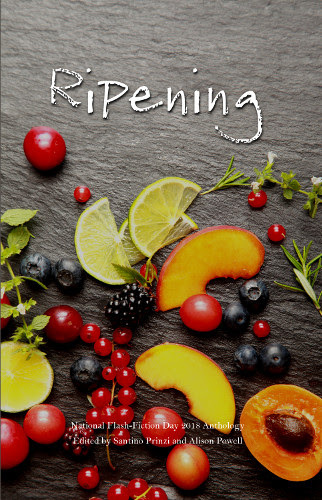 Speaking of the anthology, Ripening, it is now available to buy in both paper and Kindle formats. And although we're biased, we really think you need a copy or two in your life. And, as ever, there will be people publishing flashes, sharing their work, and generally enjoying the day all around the country and across the internet. One of them could be you, so why not celebrate the day by joining in by writing, sharing, or reading. National Flash-Fiction Day has become a staple in the calendar and the wonderful things that happen on the day are a testament to the enthusiasm of all the great writers and readers who make up the community. We're grateful for you all. Enjoy the day, and keep flashing! Copyright © 2018 National Flash-Fiction Day, All rights reserved. Published on 6 June 2018 30 November 2018 Author Ingrid JendrzejewskiCategories NewsLeave a comment on National Flash-Fiction Day 2018 is nearly here.